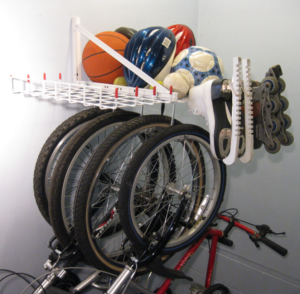 This handy garage hanging bicycle rack with shelf will store up to four bicycles as well as extra items on the handy shelf. 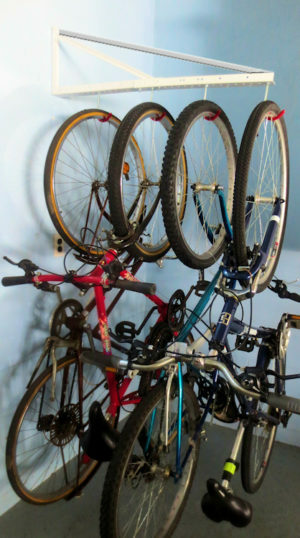 Our bicycle hangers conveniently hang bikes vertically, on sturdy hooks that have a protective vinyl coating, to protect your front rim from scratches. All of the hardware, including the wire mesh shelf, shown in pictures is included in the price. Some assembly is required. 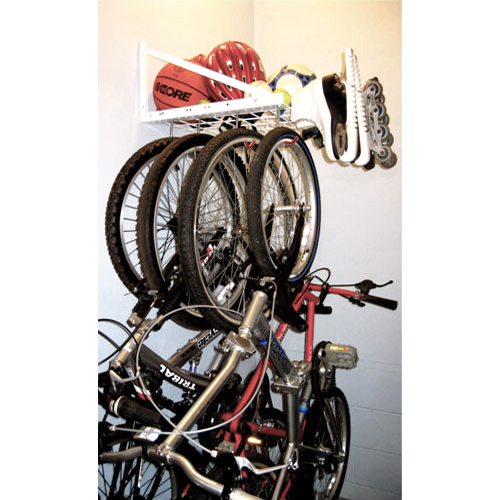 Wire mesh shelf is attached to the wall mount bracket to add even more storage capacity to your bicycle rack. 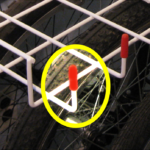 The wire mesh shelf dimensions are 24 inches ( 2 feet ) wide and approximately 12 inches ( 1 foot ) deep. 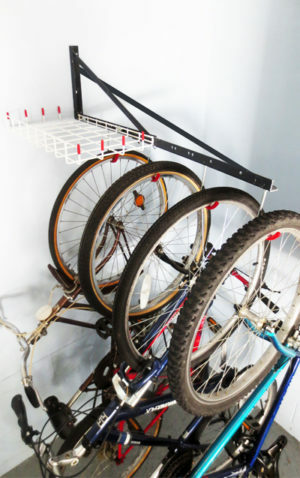 Bike storage can take up a significant amount of valuable floor space, that’s what inspired TidyGarage to design and engineer our unique garage hanging bicycle rack with shelf. 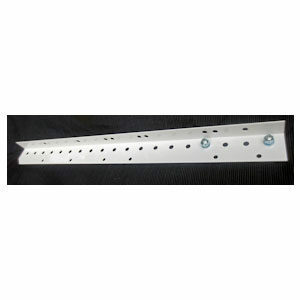 Bracket is easy to install, comes with all mounting hardware, and a set of instructions. 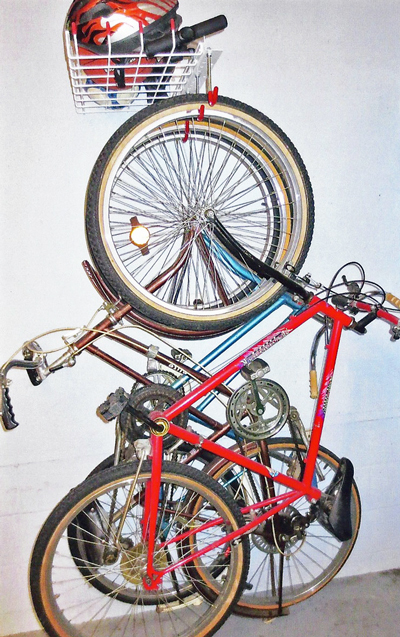 Stores up to (4) four bicycles. With the added wire mesh shelving unit, you can increase your storage capacity even more, and move items such as balls, gloves, skates and helmets, off the floor and out of the way. 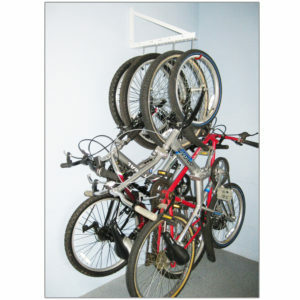 Your Hanging Bicycle Bracket is designed to hang and suspend bicycles vertically, using the front rim of the bike for support. Wire mesh shelf is attached to the wall mount bracket ( as depicted in photo at right ) with the hardware provided. 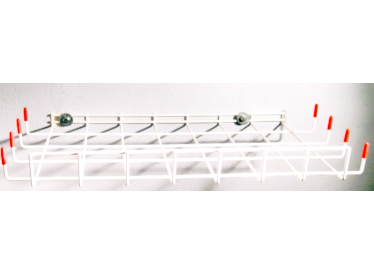 Red safety coated caps are used to cover the edges of the shelf, which are designed to protect against scratches, while providing additional support to hang items.